Make no mistake, we do business with our eyes. Visual communication is a powerful tool for getting a deal over the line and business leaders are fast realizing that. From infographics to charts and presentations, the way we present things now is a far cry from the "Death by PowerPoint" slides of the past. It makes sense, after all. They say that a picture paints a thousand words—infographics probably speak ten thousand. But for those who are already confidently using visual content as part of their regular sales pitches, marketing and so on, what’s next? Businesses should constantly be innovating, especially in a market like graphics, where competition is rising. What future trends, therefore, should business leaders and marketers keep an eye on? This article will take you through some upcoming trends and exciting developments that could impact the way we all visually communicate. Pictures speak a universal language. Therein lies their great potential and power. With workforces becoming increasingly global, an easy way to communicate quickly across borders becomes very important. People will need to collaborate and work together on projects in a seamless way, regardless of language barriers, time zone differences and geographical distance. This is where visual communication really appeals. Businesses will be able to use visual communication tools to assist staff in working together. Collaboration tools such as Trello, Slack and RealtimeBoard will become even more visual as more teams need to work together globally. Visual communication also offers a more engaging way to present and work with information, especially if dealing with raw data or a lot of information at once. Charts and presentations that are designed to be interactive and information that is presented beautifully can make a huge impact on the quality of an individual’s working day. 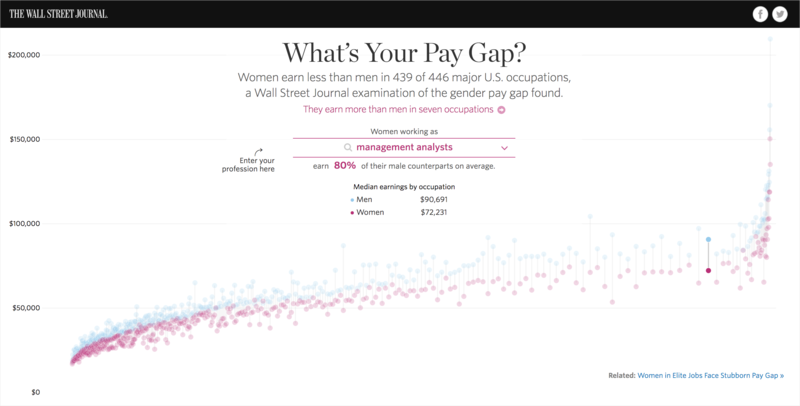 You just need to look at interactive visualizations created by big media companies such as New York Times and the Wall Street Journal to understand how data can be presented in an appealing way. For brands, the ability of visual content to speak many languages comes with an added bonus: It enables them to pitch to global clients in a simple way, using a common language that everyone understands, regardless of where they are located in the world. In the future, you might not even be pitching to a client in the same room or even country. Advances in technology such as HoloLens will soon offer the ability to physically appear like you are in the same room as another person when you’re actually hundreds of miles away. Of course, when this technology does hit the mainstream, visual communication will become even more important to businesses wishing to share information easily. Conveniently, this brings us to the next development that is going to impact visual communications. AR, VR and wearables have been around for a fair while now but are still very much in their infancy. Businesses are at the tip of the iceberg when it comes to the potential behind this technology. AR and VR devices are changing the way we see and experience the world. It’s now possible to explore the Sahara desert from the comfort of your living room. The technology is still rather new and novel to consumers, and this is something businesses can really take advantage of. B2B businesses aren’t left out either. Sales pitches and quarterly reviews would be much more novel and memorable if you were to use an AR or VR device to display key information. Kantar Retail proposes this very thing to major retailers, with AR and VR offering retail teams a way to explore shop displays, marketing and products without having to physically stack a shelf, as seen below. Wearable technology will also become an important way for consumers to engage with a piece of visual communication. Wearable devices can collect a whole load of different data on the user, from general movements to biometric data. This can be displayed through infographics and other visual tools, not just to show information in an understandable way, but also to create something really personal and eye-catching. Wearable technology can also be used by the wearer to physically interact with a piece of visual communication. The days of scrolling and swiping (at least on smartphones) may soon be over! With a simple flick of the wrist, you will be able to change slides, move items in an infographic or highlight parts of a chart. 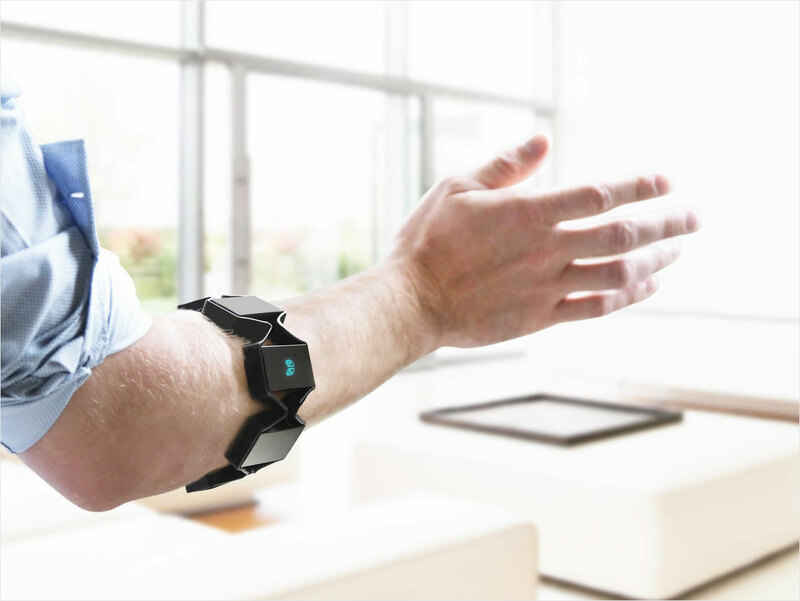 The Myo wearable, seen below, has gone some way in already proving this. Through their sensors and the biometric data they collect, wearable devices can also be used to measure an individual’s response and interest in a campaign. From the moment we wake up to when we go back to bed again at night, we are bombarded with marketing messages. As a side effect of this, consumers’ attention spans seem to be shorter than ever before. Advertisement (or banner) blindness is a growing phenomenon. The cost of consumer attention is at a premium as brands try to connect with consumers who are otherwise turned off by mainstream marketing. One of the ways brands are combating ad blindness is through creating more immersive experiences for consumers. Storytelling has become a huge trend for businesses. Telling the story of your business or the thinking behind your product and why it is so special can help people connect with your company and products emotionally. 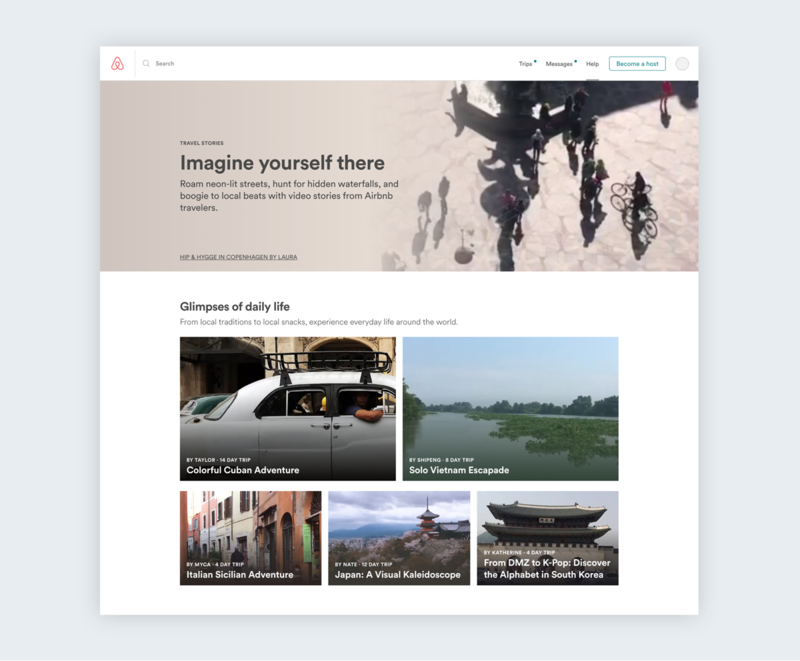 Airbnb is a good example of a brand that focuses on storytelling as a key marketing strategy. AR and VR have a significant role to play in brand storytelling, but there are other mediums you can use to communicate as well. Digital screens placed in the external environment (like a billboard or in a shopping mall) can be used to catch consumer attention at specific moments suitable for your business. In the future, visual communication will also jump from digital outdoor screens to personal screens like smartphones seamlessly. Just a few years ago, advertising company Clear Channel Outdoor unveiled smart billboards that could "talk" with your smartphone through NFC and QR codes. iBeacon, an Internet-connected device developed by Apple, offers brick-and-mortar stores the ability to send messages directly to smartphones via Bluetooth when they walk past the devices. To go one step further, visual communication could appear in the very furniture around us. 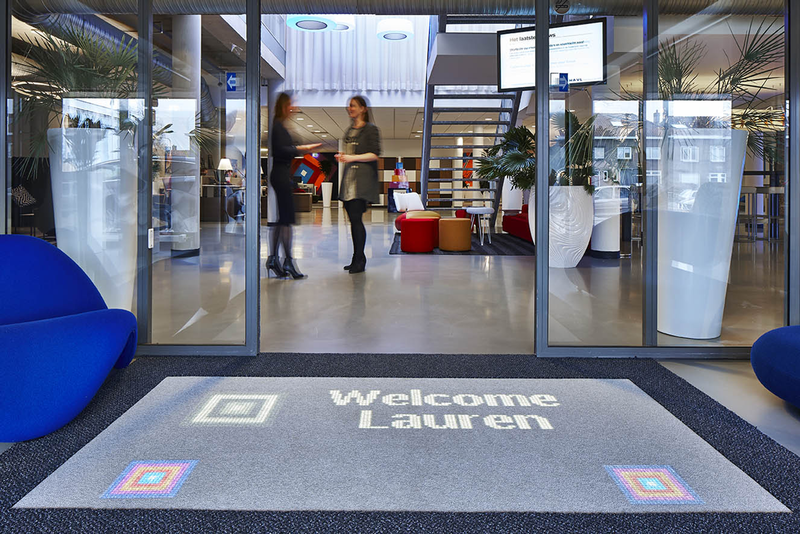 At US-based company Four Winds, a bog standard carpet has been transformed into an information display, telling visitors where to go and reminding employees when they have a meeting. Imagine this technology brought into a shopping center or restaurant. Shops could promote their latest offerings and direct consumers to their stores, while restaurants could inform customers of their daily specials as soon as they walk through the door. Visual communication through furniture will certainly be eye-catching, but it will also help to bridge the gap between the online and offline worlds. Less than five years ago, a stat did the rounds stating that we had produced 90 percent of all the world’s data in the past two years. We’ve produced increasing amounts since then. With smart homes, the Internet of Things, wearables and other smart device usage on the rise, the amount of data available to businesses is going to increase dramatically (again). With connected devices all around us, businesses will be able to gather data from our smartphones, any smart devices we have in our homes like Amazon Echo, our Fitbits and other wearables. That’s a lot of data that is going to have to be analyzed. Big data is often overwhelming for many people and businesses to process. It doesn’t matter if you’re a layman or a data scientist, to make sense of big data you’re going to have to use data visualization at some point. Services like Sisense, IBM Watson Analytics and Qlik have already developed data visualization dashboards to help businesses understand their data. Data visualization helps to break big data down into more manageable chunks that can then be analyzed to uncover insights that can help a company's operations, sales and marketing. More and more businesses are realizing the potential of the proprietary data that is produced by their operations on a daily basis. As more businesses decide to analyze their data, data visualization will become increasingly in demand. Alongside big data, artificial intelligence (AI) is another growing trend. AI is being touted as a potential replacement for many different job roles, from writers and salespeople to graphic designers. We’re in the midst of the Fourth Industrial Revolution and AI is one of its catalysts. Designers don’t need to worry about an AI taking their jobs just yet (we do still need some artistic flair after all!) However, AI is going to do a lot of the legwork in researching what content will resonate best with consumers. AI has the ability to collect and study a vast amount of data (more than a team of humans could ever achieve). Thanks to AI, businesses can now identify and piggyback on trending topics to create viral content. AI could, for instance, monitor social media to discover what a business’s target audience is talking about. This information can then be used to create visual material for social media or other channels that will really resonate with the target audience. Speaking of design, AI can also test several different versions of a campaign and tweak each design according to consumers’ reactions. In fact, this has already been tested by ad company M&C Saatchi with their Bahio Coffee ad. An AI was given several different designs to test and alter as needed according to customer feedback. 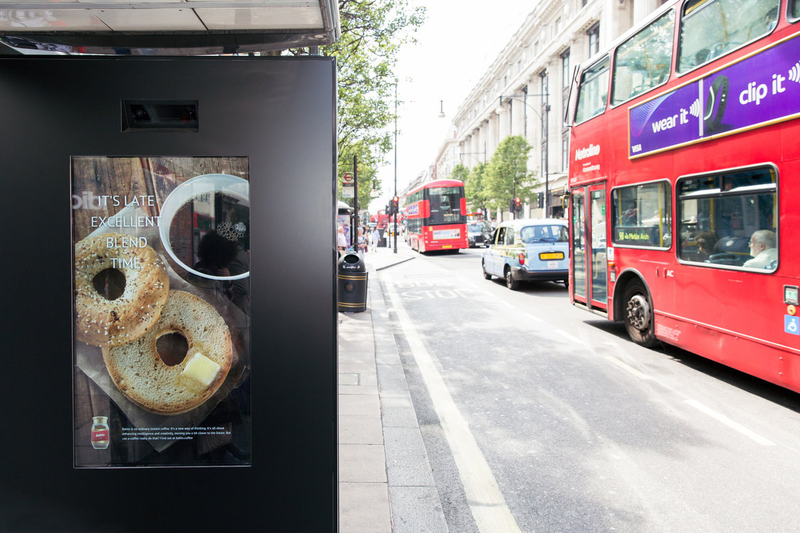 The ad was placed in a prominent position on Oxford Street in London and a motion-sensing input device was used to measure consumer engagement with the ad. Depending on the feedback that it received, the AI could alter the copy of the ad and the images used. M&C Saatchi experimented with advertising using algorithms. While the technology behind this ad is still being refined, in the future, we could all be using this particular AI to produce eye-catching and attention-grabbing visuals. Through this type of constant testing and data analysis, AI will eventually allow businesses to target audiences with pinpoint accuracy. The Rise of Visual SEO? That aforementioned AI has another use for businesses: image recognition. Google, Apple and the other tech giants have all been refining their image recognition algorithms. We’ve now reached the breakthrough moment where an AI can tell the difference between a muffin and a Chihuahua! This is no laughing matter, however. As the algorithms are trained further, image recognition will become extremely efficient at classifying and reading different images. 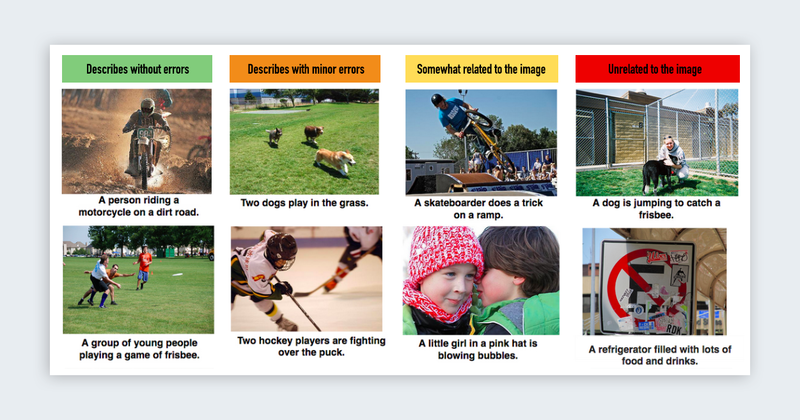 A selection of results generated by machine learning system, grouped by human rating. 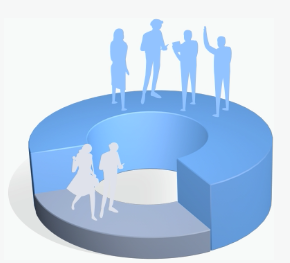 This has huge implications for infographics in particular. With more accurate image recognition, there is the distinct possibility that visual SEO will be rolled out in the near future. What form this will take and what rules it will have is, of course, yet to be discovered. It does offer businesses a great opportunity to beat competitors in image search results without having to include all of the traditional SEO information like alt text and titles. Thanks to visual SEO, we may see the rise of a whole new breed of SEO specialist: People who will assist businesses in creating SEO optimized infographics and who understand all the ins and outs of image recognition algorithms. Naturally, it will also change the ways we create infographics and other forms of visual communication. Some of the technology and developments described are almost light years away from hitting the mainstream. Others, like visual SEO, are almost a dead certain in the next couple of decades. For businesses now, there is one clear takeaway when it comes to visual communication: You must constantly innovate. 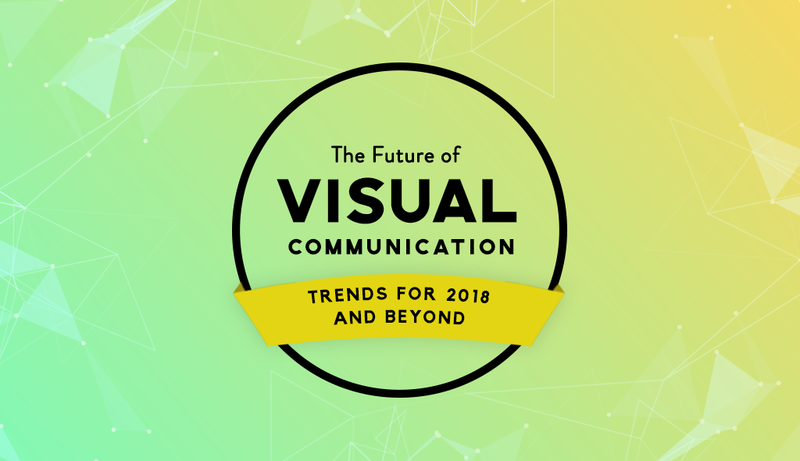 New trends and technology will come to disrupt visual communication every single year. You cannot simply create an infographic and expect it to be timeless. Make sure you always keep your ear to the ground and have an eye out for the next big thing. That’s the difference between creating content that is good, and content that will future-proof your business. 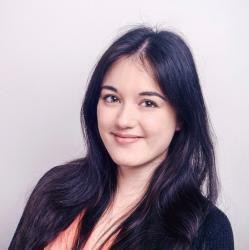 Jade Emmons works closely with businesses and start-ups to advise them on all aspects of their marketing strategy. Cutting her teeth in the tech sector, she’s seen the rise of wearables, smart cities and the Internet of Things and the substantial data that this offers businesses. She now helps businesses understand how to use different technology to its full potential. Absolutely – our hectic times often leave us with little time to process information: visual communication can help us achieve the best result in the shortest time. Great article with lots of insights and useful information. One area I don’t think was mentioned though is Graphic Facilitation and Graphic recording – both can be used via digital or large scale paper and pens. Both are live, and can be more or less interactive as needed. Awesome article. Thank you for sharing. Great help to start my future in the field of communication.